Last week I went to a conference specifically aimed at autistic people. But considering that it was aimed at autistic people (and that many of the people who planned and ran it were autistic), I was surprised and disappointed by just how inaccessible the event was for autistic people. This is going to be the first in a series of posts about how to make events accessible for autistic people. I feel like some of the things I’m going to write about will be obvious, and that might well be the case. But the fact is, I just went to an autism-specific event that ended up being very inaccessible to me and many other autistic people. So it can’t hurt to write about these things, in the hope that even one person learns something that makes things better for autistic people somewhere. It’s really not very complicated to make an event comfortable and safe for autistic people, but people often seem to get their priorities wrong when they try. Sometimes they make certain very specific changes which are good for some autistic people but make no difference for others. Sometimes they focus on just one thing, on the assumption that it’s the only change they need to be perfectly accommodating. Sometimes they simply base their changes on inaccurate information and end up with completely the wrong idea. The fact is, autistic people are all different. Different to non-autistic people, and certainly different from each other. 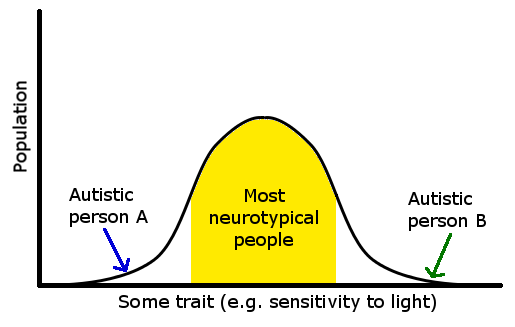 If most traits in the overall population can be represented by a bell curve, then autistic people are more likely to inhabit the extreme ends of the curve – either end. If you randomly choose two autistic people, they are likely to be even more different from each other than two random neurotypical people. So you can’t just adjust things in a certain direction and expect it to be perfect for all autistic people. If you make the lights dimmer, some autistic people will appreciate it, and others will find it too difficult to see anything. If you make the lights brighter, you have the same problem. The fact is, it’s simply not possible to individually accommodate every single possible combination of autistic experiences. So how do you deal with all these inconvenient variations? Provide choice, and lots of it. This is the basic principle underlying pretty much all kinds of disability accommodations, and should be a key aim for any event which wants to be accessible to a wide range of people. It needs to be possible for people with all kinds of different needs and preferences to find a comfortable experience at your event, otherwise it’s not accessible. In my upcoming posts in this series, I’m going to write about specific types of autistic traits, and give advice on how to accommodate them. I will, of course, be writing mostly from my own experience. But my own experience also includes knowing and talking to a lot of other autistic people, and I hope I will be able to provide an overview that will help an event be accessible to all kinds of autistic people.